Preparing for a worst-case scenario, scientists are stepping up research into the nuclear option. …. NASA’s chief concern isn’t an enormous, civilization-threatening object of the type that smashes into Earth, on average, every million years. Instead, it’s the estimated one million asteroids in our solar system that have the potential to strike our planet and destroy a city. To date, we’ve discovered only 10,000 of these…. Unlike other natural disasters, an asteroid strike is preventable. One option is deflection. If an asteroid is a decade or more away, then a slight change in its velocity would be sufficient to shift its orbit so that it would give our planet a wide berth. Deflection becomes more difficult when the asteroid is just a few years, or a few months, from hitting Earth. That’s when scientists begin discussing “disruption”—blowing it up, possibly with nuclear weapons…. [We have no] experience using a weapon of mass destruction as a precision instrument. We would need to know the ideal proximity and yield of the explosive device, as well as the asteroid’s physical properties. Is it porous and rocky, or dense and metallic, such as the 150-foot-wide iron-nickel object that fell to Earth 50,000 years ago, creating the nearly mile-wide Meteor Crater in Arizona? In other words, how does one nuke an asteroid and make sure to obliterate it so thoroughly that the bits won’t kill us like a shotgun blast? When scientists debate methods for blowing up asteroids, they speak in terms of “energy coupling”—how much of the explosive energy is transferred to the target, and the effect of that energy as it travels through the asteroid. And that’s why the composition of an asteroid can be crucial. Consider an asteroid whose orbit would place it on a collision course with Earth in ten years. At that distance, changing its velocity by just a centimeter per second (0.02 miles per hour) could nudge it enough to avert disaster. One way to do this would be a kinetic impactor—a high-speed spacecraft that would crash into the asteroid, delivering energy by dumping its momentum. But, here’s the catch: The larger the asteroid, the more massive the spacecraft would need to be to knock it off course. And there’s a limit to how much mass we can launch to an asteroid. That’s when a nuclear weapon might be the better choice. A spacecraft could deliver a nuke that would explode near the asteroid, irradiating a large fraction of its surface with x-rays and neutrons. “Those heat up the surface of the asteroid to very high temperatures, vaporize it—and then the blow-off momentum from that vaporized material imparts a gentle change in velocity to the asteroid,” says Megan Syal, a researcher at the Lawrence Livermore National Laboratory in California who is working on planetary defense scenarios. But, Syal adds, the same blast wouldn’t affect all asteroids the same way. If the surface of the asteroid contains light elements such as water-enriched minerals or water ice, the x-rays and neutrons will penetrate more deeply than an asteroid whose surface is metallic. “It’s harder to couple energy as efficiently in those cases,” says Syal…. On September 18, 2015, Brother Guy Consolmagno SJ was appointed the new director of the Vatican Observatory. Consolmagno is a planetary scientist and educator who has recently been the curator of the Vatican meteorite collection. His Ph.D. is from the planetary science department at the University of Arizona. Last year he won the Carl Sagan medal of the American Astronomical Society for his contributions to public understanding of science. He stated: I am honored and humbled that Pope Francis has appointed me to this position. I can only look in awe at the wonderful things previous directors have accomplished, especially the two Jesuits who have been my directors, Fr. George Coyne, SJ and Fr. José Funes, SJ. I am humbled by the continued support of the Holy See for our work in Astronomy, ever since the Observatory was first founded by Pope Leo XIII in 1891. It is important to remember that this Observatory was a Pope’s idea, not ours! But we do this work not just because a Pope wants us to do it. All the science we do, and all the outreach we do, reflects a quality that motivates everything we do in astronomy: a sense of joy. The stars are glorious, and it’s a treat to be engaged in their study. Winner of 2015 Carl Sagan Medal for outstanding communication by an active planetary scientist to the general public: Dr. Dan Durda (Southwest Research Institute) has consistently communicated with the public about the wonders of exploring new worlds via the written word, the spoken word, and visual artistry. Dan writes for popular astronomy magazines such as Sky & Telescope and Mercury and authors columns, articles, and blogs for the public. As a natural extension of his compelling writing, Dan is sought as a planetary science spokesperson, both for lectures and on TV. His science addresses impacts and impact processes at many scales; thus he has become a requested media commentator on catastrophic asteroid impacts. The artistic dimension of Durda’s public outreach, however, sets him in a class apart. His art derives from a healthy dose of scientific knowledge, though, as Dan says, “I’m not afraid to loosen the reins at times.” His paintings and digital art present scientifically grounded depictions of solar-system objects as well as alien worlds. Dr. Durda is currently a planetary scientist at the Southwest Research Institute in Boulder, Colorado. He earned his bachelor’s degree in astronomy from the University of Michigan in 1987 and his master’s and doctoral degrees in astronomy from the University of Florida in 1989 and 1993, respectively. The term potentially hazardous asteroid (PHA) is potentially hazardous when communicating with the media or the public. Even as a technical term it is confusing, since by the original definition a PHA must be more than 200m in diameter. Few of us today would consider an impactor the size of Tunguska, or even ten times more energetic, as not hazardous. But my subject here is how the terms hazardous or potentially hazardous are perceived by the public. Most of the asteroids that come close to the Earth are classified as PHAs. At the same time we know that an asteroid with a well-determined orbit that will miss us by a million km or even a few tens of thousands will not hit us, not this time around in any case. But that is not how the word hazardous is interpreted in plain English, when a potentially hazardous asteroid is one that might hit us. So we tell the press that a potentially hazardous asteroid is coming by, and then when they express concern we say ”oh no, it can’t possibly hit us.” It is no wonder that some will conclude either that we don’t know what we are talking about, or that we are not being honest. In my personal opinion, we should try to avoid the term potentially hazardous in communicating with the press or the public, since this description is easily misunderstood and can lead to unjustified fear of every NEA that comes close. NEO News (now in its twentieth year of distribution) is an informal compilation of news and opinion dealing with Near Earth Objects (NEOs) and their impacts. 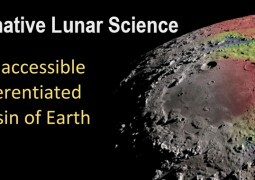 These opinions are the responsibility of the individual authors and do not represent the positions of NASA, Ames Research Center, the International Astronomical Union, or any other organization. If anyone wishes to copy or redistribute original material from these notes, fully or in part, please include this disclaimer. If you wish to be removed from this mailing list, please reply with the word unsubscribe in the title. A SSERVI white paper on the accessible, differentiated cousin of Earth.